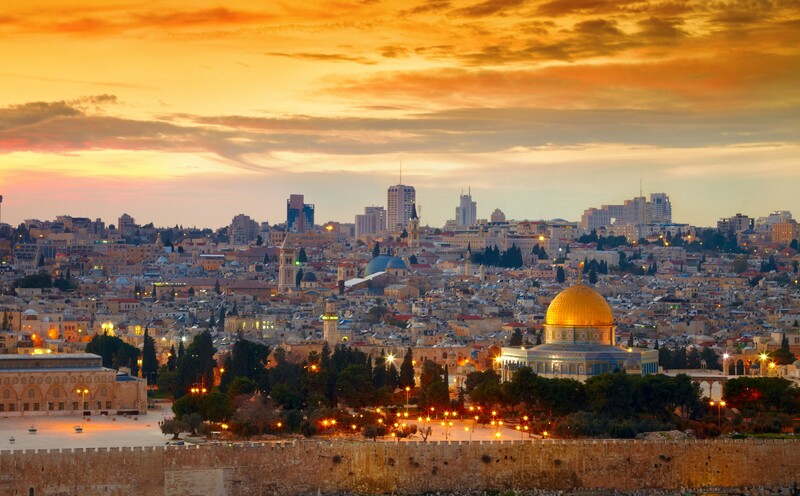 Overnight flight to Israel for your Holy Land journey. 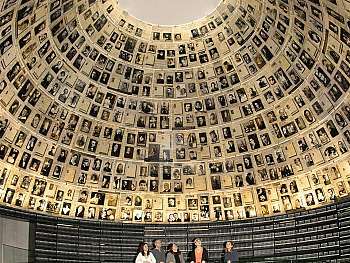 Arrival at Ben Gurion Airport, where you will be met by IBMT Tours representative and transferred to your hotel. Overnight in Tel Aviv. Depart Tel Aviv and drive along the coastal plain to Caesarea, capital of Judea under the Romans. Visit the excavations of the ancient city, Roman theatre and aqueduct. Proceed to Muhraka, the site of confrontation between Elijah and the prophets of Baal; enjoy the spectacular view of the Jezreel valley and the lower Galilee. Continue to Megiddo, identified as the site of Armageddon; visit the archeological excavations including the well-preserved water supply system. Onto Acre to visit the remarkable underground Crusader City and crypt; walk through the Old City recognized by UNESCO as world heritage site , the local market and harbor. Overnight in Kibbutz. 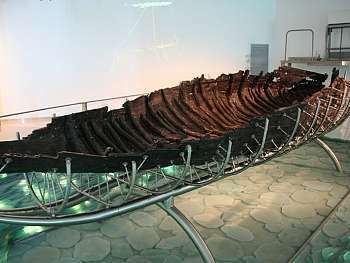 After a short tour of Tiberias, enjoy a boat ride on the Sea of Galilee; Visit Yigal Alon museum where the "Jesus boat", an ancient fishing boat from the 1st century, is displayed. Continue to Capernaum; visit the remains of the 2nd century synagogue. Proceed to Tabgha, the site of the miracle of fish and loaves, and visit the church of multiplication with its 4th century mosaic floor. Continue to Mount of Beatitudes, the place where Jesus delivered the Sermon on the Mount. 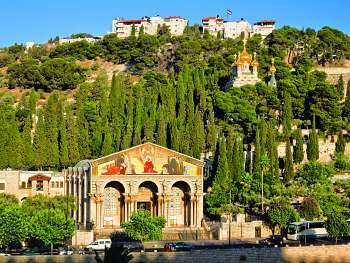 Drive to the Banias springs and waterfalls and tour the Golan Heights. Return to kibbutz Lavi for overnight. Drive to Nazareth via Cana of Galilee visit the Wedding Church, where Jesus performed his first miracle turning water into wine. Upon arriving to Nazareth Visit the Church of Annunciation, St. Joseph's workshop and Mary's well. We will proceed to Yardenit, the baptismal site on the Jordan River; continue to Beit Shean, a newly excavated city, and visit the Roman theatre. Drive along the Jordan River to Jerusalem. Overnight in Jerusalem. 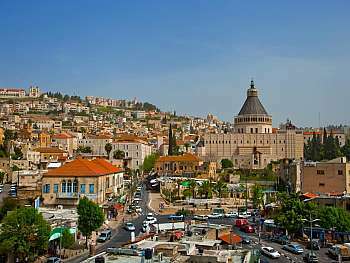 Drive to Mount of Olives for a panoramic view of the city; visit the Church of All Nations, King David's Tomb and the Room of the Last Supper on Mount Zion. Enter within the walls of the Old City and visit the Cardo, Temple Mount (entrance to the mosques not included), Western Wall, Via Dolorosa, the Church of the Holy Sepulcher, Oriental Bazaar and Garden Tomb. Overnight in Jerusalem. Drive to Qumran, where the Dead Sea Scrolls were found, visit the ancient city of Qumran and drive along the shores of the Dead Sea to Massada, the last stronghold of the Jewish people after the destruction of the Second Temple in 70 A.D. Ascend Masada by cable car and visit the food storeroom, water irrigation system and Herod's Palace. Continue to the Dead Sea, the lowest point on earth; enjoy the opportunity to float in the unsinkable water and cover yourself with the mineral rich mud, believed to have therapeutic effects. Return to Jerusalem for overnight. Drive from Jerusalem to the border crossing procedures to enter Jordan. 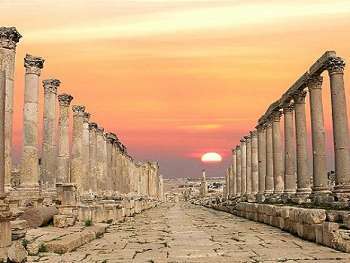 Proceed to Jerash - city of the Decapolis, location 45Km North of Amman in the fertile heights of the Gilad mountains, visit the ancient Roman city with colonnaded streets, the baths and the hill of the top Temple etc. We then continue to the Capital city of Jordan Amman for a city tour. Overnight in Amman. After early breakfast, leave the hotel and travel south on the road to Wadi Musa. Then we will ride on a convoy of horses to the "Siq" (canyon) and then on foot to Petra known as "Sela Edom" or red rock city, the ancient capital of the Nabateans from 3rd century B.C. 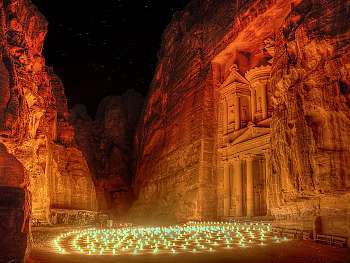 to 2nd Century A.D. Visit the most interesting monuments, such as the Treasury, El Khazneh (a tomb of a Nabatean king) then the field of tombs, obelisks, the altar, (Al Madhbah) from this point you can view the whole of the rock city. Return to Wadi Musa village for overnight. Drive to Madaba to see the ancient mosaic map of the Holyland and ruins of historical sites. Continue about 10Kms. 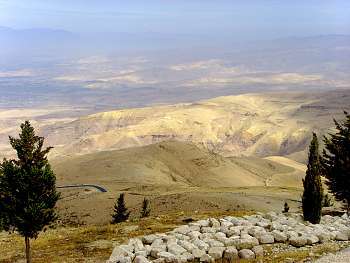 to Mount Nebo, from where Moses viewed the Promised Land. From there you will see the Jordan Valley, Jericho, Dead Sea, etc. Visit the remains of a Byzantine church with a mosaic floor, and then drive to the border and to Tel Aviv. Overnight in Tel Aviv.